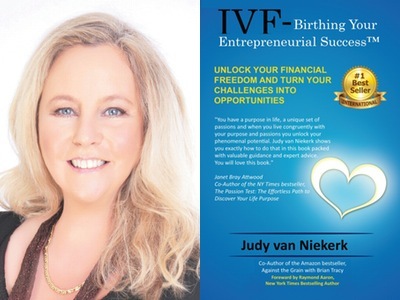 Judy van Niekerk has been inducted into the Bestselling Authors International Organization for her #1 International Bestseller, IVF-Birthing Your Entrepreneurial Success™: Unlock Your Financial Freedom and Turn Your Challenges into Opportunities. Judy van Niekerk is a serial entrepreneur in the real sense having established businesses in many different industries from environmental agency and training, pioneering agricultural projects, high tech companies, marketing and advertising agency in which she has achieved international acclaim in many of them including International Woman Winemaker of the world, Bravest Woman UK to name a few. She has also been an international sports woman representing her adopted country South Africa at world championships scuba diving as well as a best-selling author and international speaker.